Other news: People using Aglet Modula-2, the compiler written by Tom Breeden, may find the work of Frank Ruthe useful: "While playing with Tom Breedens PPC native Modula-2 [AgletM2PPC] environment I really missed integration to CubicIDE. So I generated some new files for a *slightly* better IDE integration. You need Toms AgletM2 PPC port and his GoldED Modula-2 dictionaries and guide files." You can also find Aglet Modula-2 and Mr. Ruthes work on OS4Depot. Latest changes to GNU Modula-2 as well as the release of gm2 0.72 have been reported to the GNU Modula-2 mailing list. Amd64 binaries are available. There is a first release of "Schwarzer Kaffee" (german for "black coffee") which is a SDL wrapper for GNU Modula-2. The author underlines that the project is in a very early stage but some important things are already working. The release was first announced to the GNU Modula-2 mailing list. You may be interested in Niklaus Wirth's talk (YouTube) at GTAC 2009. Thanks to Jan Verhoeven's Modula-2 Pages where I found the link. A new package is available from the Sources Store for Modula-2 and Oberon-2. The file is called FreeImage3.13.zip and contains files to use the FreeImage library (which is "an Open Source library project for developers who would like to support popular graphics image formats like PNG, BMP, JPEG, TIFF and others as needed by today's multimedia applications.") with XDS Modula-2. Latest changes to GNU Modula-2 and the release of version 0.70 of the compiler have been announced to the GM2 mailing list. Gaius Mulley reports that all GNU Modula-2 regression tests pass on debian lenny stable x86_64! There was also a message documenting latest changes to the compiler in the middle of october. There is a new mailing list for news and discussion about Objective Modula-2. A new list of Modula-2 Compilers categorised by availability is now available. Latest changes and a proposal for the GNU Modula-2 compiler by Gaius Mulley may be discussed by using the GNU Modula-2 mailing list. As we seem to be near to the release of GNU Modula-2 0.70 the compiler reached a major milestone. Implementation of the ISO Modula-2 language (ISO/IEC 10514-1:1996 Modula-2, Base Language) is complete. The website was updated as was the documentation. Read the announcement here (including latest changes to the compiler). P2Ada has a new home at SourceForge.net (for about one year now...). P2Ada is a Pascal to Ada translator which also allows the translation of Modula-2 to Ada 95 via a special program called mod2pas.zip. As the Modus Quarterly Newsletter (Modula-2 News for MODUS, the Modula-2 Users Association) was mentioned in comp.lang.modula2 recently I tried to find content from this newsletter. All I could find is an article with the title "Automatic export of identifiers from the definition module" by Arthur Sale. Does anyone have more? Some of you may be interested in the Language Breakdown in Open Source. Modula-2 does not (yet) appear there. The only language from the Wirthian family to show up is Pascal (and if you count it in, Ada). In a sidenote about these pages I want to inform you about lots of corrected or deleted dead links and about some smaller reorganisations of content here and there. If you find out something is not working, please tell me. I just visited the homepage of Modulipse and found out version 0.0.3 has been released in June. The announcement states that "it is now possible to work with Modula-2 source files that are outside the workspace". Thanks for adding this! Packages for Linux, Windows, Solaris and OS X are available for download. A polished presentation of the Objective Modula-2 Grammar is available from the projects homepage now. The update was announced in comp.lang.modula2. Chris Burrows uploaded an important piece of software for the history of Modula-2: "a) a zip file containing the source code of a Macintosh version of Wirth's single-pass Modula-2 compiler which generates MC68K code b) a copy of the release notes that accompanied the original Lilith version. This single-pass compiler was a significant improvement over the original 4-5 pass M2 compiler. It consists of approx 13,000 lines of source code compared to the original 19,000." GNU Modula-2 now supports multidimensional arrays. Several messages to the GNU Modula-2 mailing list report progress on the feature. The Modula-2 to Modula-3 translator m2tom3 is now available from this site as it is getting harder to find a working download location. Version 2.35 of the Modula-2 FAQ was released: "Henceforth only a notice about this site (and no longer the entire FAQ) is distributed on USENET News and thence to Google). The FAQ will only be available here on Modula-2.com." As I just updated the links to the recently made available ANTLR grammar for PIM and ISO Modula-2 I also want to point out that these ressources and the Xcode 3 language specification for Modula-2 are now available from http://modula2.net. Jan Verhoeven published a modified version of a random number generator as described in Programming in Oberon by Niklaus Wirth and Martin Reiser. Following a hint by Terry Ross in comp.lang.modula2 I found a lot of freely available articles related to Modula-2 originating from www.atarimagazines.com. It seems we are close to a release of Aglet Modula-2, a Modula-2 compiler generating native PPC code for Amiga OS4. The compiler compiles itself since march and a beta was released in may. You may want to help in testing. And last but not least the article Class is a Record - Wirth was right after all has been published. You are invited to discuss it in comp.lang.modula2. Objective Modula-2 will from now on be accessible at http://objective.modula2.net/. You may also be interested in a question asked in comp.lang.modula2: "I wonder what everybody's interest in Modula-2 is. Are you simply interested because you have to maintain legacy code or are you actually doing new development in Modula-2, if so which area? system development? embedded? GUI apps? Web? Or is your interest only due to being taught M2 at university and you're out of here as soon as the course finishes?". For those who do not use a browser to access newsgroups click here. A new file for Xcode syntax colouring for PIM Modula-2 is available at the homepage of Objective Modula-2 (scroll down, it is near the bottom of the page). The announcement can be found in the archives of comp.lang.modula2. A few weeks ago I mentioned Zonnon here. A post in comp.lang.modula2 now pointed me to a forum for the language - just in case you got interested. Benjamin Kowarsch has kindly made ANTLR grammars for both PIM3, PIM LL(1) and ISO Modula-2 available. These were made for documentation purposes but can be used to generate syntax diagrams with ANTLRworks. The original announcement of the author was posted in comp.lang.modula2. Other news: Latest entries to the GNU Modula-2 ChangeLog (and latest regression test results) have been reported to the GNU Modula-2 mailing list. Zonnon is definitly not Modula-2 but a language closer to its ancestor than for example Oberon. A short description from Wikipedia: "Zonnon is a general purpose programming language in the Pascal, Modula-2 and Oberon family. Its conceptual model is based on objects, definitions, implementations and modules. Its computing model is concurrent, based on active objects which interact via syntax controlled dialogs. The language is being developed at ETH Zürich Institute for Computer Systems by Prof. Jürg Gutknecht. Zonnon introduces the concept of 'active objects' which are used to represent real world concurrent objects within computer programs." You may be interested in the language report and the compiler. While Zonnon can be used with Visual Studio 2005 (there are implementations for .NET and Mono/Eclipse) there is also a simple open source IDE called Zonnon Builder available. Latest changes to the source code of GNU Modula-2 have been reported to the GNU Modula-2 mailing list. There was some noise in comp.lang.modula2 recently. Some of you may be interested in the discussed topics. 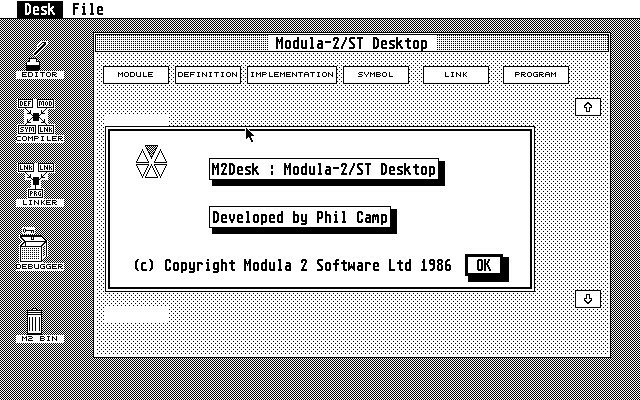 Chris Burrows informed me about a second (1-pass) Modula-2 compiler included in Emulith (link to ftp-server). Last but not least I want to interest you in a message and thread in the XDS Modula-2 forums. We may have a chance to bring life to a Modula-2 IDE. So please express your interest. The homepage of the Kronos research group was updated recently. You may be interested in the sourcecode of the Kronos workstation which is now available under a BSD-license. There is also an emulator and a lot of amazing information on the history of the system. Wikipedia provides a good overview. Other news: Sometimes people tell me about quite amazing things. A few months ago the description of Objective Modula-2 was deleted by Wikipedia because of the lack of an implementation. Objective Modula-2 is "a hybrid between Smalltalk and Modula-2 based on the object model and runtime of Objective-C. The design is an example how native Cocoa/GNUstep support can be added to static imperative programming languages without implementing a bridge." Benjamin Kowarsch now informs via the GNU Modula-2 mailing list that the project is alive. Some papers and code can be fetched from the projects homepage. [UPDATE:] I just recognized the Objective Modula-2 Homepage is now also part of the Modula-2 website ring which has its home at ModulAware.com. Jos Dreesen released a new version of Emulith, the register-level emulation of the Lilith hardware. Version 1.2 (release notes) introduces a native Windows port and some interesting new features. [UPDATE:] The official announcement by the developer is available. And did I mention that Emulith includes a Modula-2 compiler? Three links to messages documenting the latest changes to GNU Modula-2: 21 Jan 2009, 04 Feb 2009, 04 Feb 2009. Several messages document recent changes to the sources of GNU Modula-2: 05 Jan 2009, 07 Jan 2009 and 10 Jan 2009. Most important the implementation of type COMPLEX (COMPLEX, LONGCOMPLEX, SHORTCOMPLEX and if the architecture/gcc runtime supports them COMPLEX32, COMPLEX64, COMPLEX96 and COMPLEX128) is nearly complete. Andreas F. Borchert announced the availability of some historic Modula-2 material in comp.lang.modula2. Available for download are "the sources of the ETH Zurich Multipass Modula-2 compiler for the Lilith and an emulator, written in C, which we used in 1983 to bootstrap to another platform. You'll find this material along with some instructions how to revive all this with the help of a simulator of the Interdata 8/32 from the Computer History Simulation Project at http://www.mathematik.uni-ulm.de/modula/history/." Recent changes to the sources of GNU Modula-2 have been reported to the GNU Modula-2 mailing list. Jos Dreesen released Emulith. This interesting piece of software is a register-level emulation of the Lilith hardware. "You will need a reasonably fast PC running Linux and having at least 1280x1024 resultion." The author reports that the emulator also runs under OS-X and CygWin/x (download via ftp). Daniele Marangoni sent new files for Notepad++. The archive contains a Modula-2 API definition for Notepad++ v.5.0.3 to be used with the XDS Modula-2 compiler. Gaius Mulley sent two interesting mails to the GNU Modula-2 mailing list. First one informs that "Steve Giess has kindly contributed a port of xmodula to gm2. I've just wrapped it up with a standard configure, Makefile, ChangeLog etc. It appears to work with the current cvs gm2 on a variety of i386 and x86_64 GNU/Linux platforms albeit the release number is 0.1." The other mail informs that "Michael Lambert has kindly built gm2 for the Alpha platform running Debian GNU/Linux Stable. Both this platform and x86_64 are using the LP64 memory model and both platforms are seeing no regression test failures at present." Web Family Tree is a freeware program by Peter J. Moylan that permits you to display your family tree in a web browser. It is a Modula-2 program using the common gateway interface. The source code is available. Those interested in this relatively simple way of getting a graphical interface for Modula-2 programs may be interested in the CGI related pages by Jan Verhoeven. Other news: There is a new page describing howto create a Debian package for GNU Modula-2. Binary packages of GNU Modula-2 0.68 are available since november 8th to the public capable of using Debian repositories. Please help to test the upcoming release of the compiler. GNU Modula-2 0.63 has been released. There have been a lot of recent changes accompanied by discussions in the GNU Modula-2 mailing list. Big steps were made with the implementation of ISO features and the ISO libraries (The archives of the mailing list for October and September have more). Anyway, here is the release announcement, and an email with details on some changes and additions. Up to date documentation is also available. [Update:] Gaius Mulley published an updated changelog. There is a simple page to help you getting started with Google Code Search. Most sites and download locations offering Modula-2 sources can already be found there. But some of you still might want to add something (you may also add CVS and Subversion repositories). Some information on the progress and the plans related to GNU Modula-2 is again available at the GNU Modula-2 mailing list. Latest changes to the source code of GNU Modula-2 have been reported to the GNU Modula-2 mailing list. [Update:] Gaius Mulley has made available a screencast showing that Python can catch GNU Modula-2 exceptions. More and more parts of Murus are translated by Jan Verhoeven and published in the download section of the Mocka and Modula-2 mailinglist. Mr Verhoeven also announced a working version of a compiler for the PLOV language which seems to be a simplified version of Modula-2. Thanks to Jos Dreesen more Lilith goodies are availeble now. "Most important is a binary image of the Lilith Systemdisk, and a subdirectory containing all files ( more then 700..) of that systemdisk. Among these files are: Medos binaries and source code. Modula-2 compiler binaries with source code. Lilith system utilities with source code. Bootfiles and system files. Lilith microcode source and assembler. Also available are hardware docu and some screenshots." Page Six an IRC-bot written entirely in Modula-2 has got a new home temporarily. A little program available in a lot of different programming languages seems to need improvement. Two documents (Generics In Modula-2: ISO/IEC 10514-2 and Object Oriented Modula-2: ISO/IEC 10514-3) are now available from the Modula-2/Oberon-2 Sources Store (scroll down in the download-section). I could not open one of the files but the other one still was and is very interesting lecture. Maybe some of you are interested. More and more interesting facts (for those interested in the history of Modula-2) about Modula-GM, the Modula-2 dialect used and developed by General Motors and Delco Electronics are published at the GMnext Wiki. One example is an article about the Development of Modula-GM, another one sums up the Development of Electronics for Indy 500 cars and engines. Recent messagess to the GNU Modula-2 mailing list document interesting changes to the GNU Modula-2 compiler. Exception handling seems to work now and some examples are there to help you getting started. This is a major step towards ISO compliance. A new project was started at SourceForge.net. It is called Modula2Plugin and still in a very early planning stage. Description from the project page: "The goal of this project is to provide an IDE for Modula-2 in the form of a plug-in for Eclipse and/or an add-in for Visual Studio (2008). It will be integrated with the XDS Modula-2 compiler." Tom Breeden published a beta version of Aglet Modula-2, a compiler generating native PPC code he developed for Amiga OS4. Beta means please help in testing. A special version of Rowley Modula-2 is now available from the languages section of Ram Meenakshisundaram's Transputer Home Page at classiccmp.org. While I knew there were versions of this compiler for OS-9/68K this seems to be a version for the Transputer HeliOS system. I didn't manage to open the archive so anyone out there who knows more? Gaius Mulley reports recent changes to GNU Modula-2 to the gm2 mailing list: "With these fixes and additions the examples in gm2/examples/swig work. Specifically it now allows users to create shared libraries given an implementation module. The examples/swig/strio will now flush the buffers during the FINALLY statement sequence. Thus users should be able to implement Python modules using GNU Modula-2, so long as the top level definition module uses base types." Some messages to the GNU Modula-2 mailing list document recent changes to the GNU Modula-2 compiler. There is also a message requesting your opinion about the implementation of shared library support. Finally basic Swig support is now available. "This allows scripting languages (perl, python and tcl) to access Modula-2 implementation modules." (Information about Swig). The sources of Medos have recently been announced and are now available. Medos was the operating system of the Lilith workstation, the famous computer designed by Niklaus Wirth. And the latest changelog of GNU Modula-2 was posted to the mailing list. Two recent messages by Gaius Mulley to the GNU Modula-2 mailing list document a lot of changes to the compiler. New data types and support for exceptions are only two examples from a long list of changes. Some explanations and clarifications can be found in another message. Files needed for Modula-2 syntax highlighting with Notepad++ are now available from the download-area. A short readme is included in the archive. Thanks a lot for providing your work! I just built GNU Modula-2 using the Cygwin Layer on a Windows Vista Laptop [UPDATE: download the build (~19MB)]. It compiled and installed out of the box (using the latest archive gcc-4.1.2+gm2-cvs-latest.tar.gz). I built a simple hello world program just to test functionality: GM2 and Vista - impressive (more information). Some Modula-2 enthusiasts may be interested in a bunch of documents related to the Lilith personal computer. Chris Burrows found them and they are available from Bitsavers.org. Some of you may also be interested in a syntax highlighter for Notepad++ which can be requested via email. Looking around I found a page entitled Objective Modula-2 1.00 (Reference Implementation). Another infunctional link can be found at Softpedia. Both links were added in july 2007 and are broken at the moment (old infunctional adress). "Objective Modula-2 is an extension to Modula-2 which follows the Objective-C object model and retains the bracketed Smalltalk message passing syntax introduced in Objective-C. Like Objective-C, Objective Modula-2 is a reflective, object oriented programming language with both static and dynamic typing. It is intended as a safer alternative to Objective-C for Cocoa and GNUstep software development. It retains most of Modula-2's features, most importantly data encapsulation with nested modules, explicit import and export lists and strict type checking" (description taken from Wikipedia). Does anybody have more information? Who is the developer mentioned at the listed sites? Interesting news from the GNU Modula-2 mailing list. Gaius Mulley uploaded some screen-casts to show you the complete process of building the GNU Modula-2 compiler. "If anyone is wanting to build GNU Modula-2, but is a little unsure how to go about it then this is how I build it on a Debian Etch 64bit machine." David Moreno, developer of Modulipse, sent a message to the GNU Modula-2 mailing list describing howto build the compiler on a computer running Microsoft Windows using a Cygwin environment. Please note that some of the steps he describes are no longer necessary as they were applied to the sources of the compiler already. Last but not least you may be interested in the latest changes to the gm2 compiler. Modulipse, the Modula-2 IDE based on the Eclipse platform, got a homepage now. GNU Modula-2 now supports constant literal constructors conforming to the ISO Modula-2 standard. Gaius Mulley reported this and a lot of other recent changes to the GNU Modula-2 mailing list. The archive of the mailing list also contains a thread called Modula-2 IDE which informs about Modulipse and the Alpha editor family. The latter provides a powerful Modula-2 mode and recently added support for GNU Modula-2. Modulipse 0.0.2 was released last friday. The changelog informs about the following changes: procedure folding now works correctly for nested procedures, there is an overlay icon to distinguish Modula-2 projects now, code templates for procedure definitions were added, the user guide has been updated and reorganized, and unnecessary classes and icons were removed. Click here to visit the News Archive.